Most modern astrology tropical charts comprise of a circle that's been "cut" six times creating 12 sections. The circle is 360 degrees or points equally spaced around the circle. In minutes (not time but of degrees), that would be 21,600 potential points around the circle that a chart can start and end. If we are even more into precision, in seconds, it's 1,296,000 potential points. [Degree is represented as a small circle superset after the number °, minutes are represented with an apostrophe ', and the seconds are represented with a quotation mark ". It may look something like 29° 59' 59".] The chart is based on an approximate 24-hour clock. The complete rotation of the earth. The Sun's *movement, even when we can't see it, is still being factored into the chart. Nutshell, if a baby is born in the morning between midnight and noon, that baby's Sun sign is likely to be situated in the chart's houses located on the eastern (left hand) portion of the chart, i.e. houses three, two, one, twelve, eleven and ten. The afternoon and evening babies have sun sign placements in the western portion (right hand) of the chart, i.e. houses four through nine. The location of the birth plays a role in the precise placements of the rising (horizontal) and vertical placements. Okay, now that we are basically at the end of the story, it's time to start at the beginning of casting the "natal chart." Note - This article is geared for beginners and we will not be discussing how to calculate a chart. But, by the time you reach the end of this article, you will pretty much know if your chart was cast correctly for you. Also, I am including a picture of a basic whole equal house chart to help you see what I am describing for each of the four significant areas of the chart. Let's say that you were born in the middle of a huge, flat field (most of us weren't and I'm not recommending this as an option). Okay, so this imaginary field will be the layout for the "chart." Not that you would remember or even be able to see it all that clearly as a newborn. But, when you look around, you have an unobstructed view of the horizon in a complete circle (360 degrees around). That is how the round "tropical" chart is formed. The chart always starts by looking to the east for correlating a "starting point" with where the Sun is situated in relation to the east. In our everyday lives, the Sun "rises" in the east and sets in the west. It's that relationship of time, space and the location of the Sun that forms the "rising" sign and Ascendant, sometimes referred to as the eastern point. An accurate date, time and location is very important for the accuracy of the chart. The astrologer will "cast" the chart in this way so that s/he can accurately "delineate" the chart. Now turn to your left, counter-clockwise, and face the northern horizon. In your chart, that is the Immum Coeli, "IC," (Latin for "beneath celestial" or under heaven). (In some European charts, I have seen this referenced as FC. I have not found what those initials represent.) The IC is sometimes referred to as the northern vertical, northern meridian, northern point or the Nadir. If your Sun is located near the Nadir/IC of the chart, then you were probably born near midnight. The fourth house is the second angle in your chart. In the zodiac, this would be Cancer. The Tropic of Cancer is actually located in the northern hemisphere. It is the latitude 23° 26' 16" north of the equator. The point at which the Sun, during the solstice around June 21st, reaches it's highest vantage point for the year in the northern hemisphere. This is the start of summer for the northern hemisphere and winter for the southern hemisphere. While most natal charts may not have Cancer for the IC, the dynamics are similar. Did you notice that the charts are "tropical" and that one of the four seasonal changes occurs when the Sun is over the "Tropic of Cancer?" Turning to the left again, you are now facing the western horizon towards the third angle of the chart, the seventh house, known as the Descendant and western point. The Descendant opposes the Ascendant. The Descendant is referred to as the "setting" sign. It is also known as the occidens or occidental. Similar to the other two angles, if you were born late in the afternoon or early evening around 6ish, then your Sun placement should be close to this angle. In the zodiac, Libra represents the seventh house, most prominent for the second equinox (third season) of the calendar year around September 21, when the Sun is moving southward over the equator. One last turn to the left. Finally, the fourth angle of the chart is the southern vertical, southern point or the south meridian, also known as the zenith. 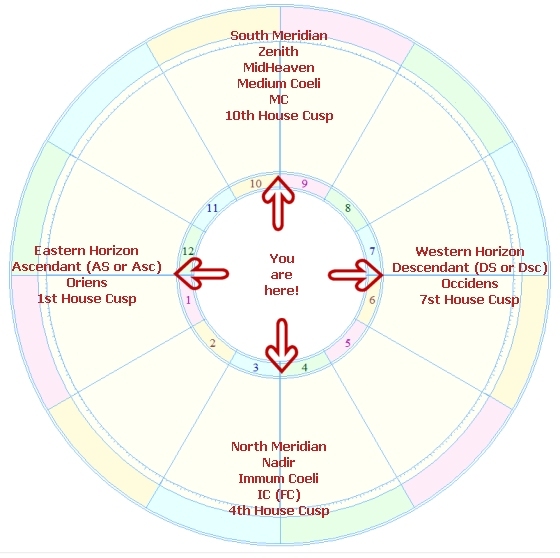 The tenth house cusp becomes the Mid heaven for the chart. The Latin term is Medium Coeli "MC" meaning middle heavens. If you were born near the noon hour of the day, your Sun should be located close to the Mid heaven of your chart. In the zodiac, Capricorn represents this fourth angle and similar to Cancer, there is a Tropic of Capricorn in the southern hemisphere. It is the latitude of 23° 26' 14" south of the equator. The point at which the Sun, during the second solstice around December 21st, reaches it's highest vantage point over the earth for the year in the southern hemisphere. This is the start of summer for the southern hemisphere and winter for the northern hemisphere. There you have it. The first basic but very important components for creating your chart. I do want to make one last but very important point that concerns "T-I-M-E." Some regions of Earth use standard time exclusively while others may use some form of daylight saving or different offset. Time offsets can really mess with the accurate casting of a chart if the correct time is entered but the "incorrect time offset" is utilized. A second article has been written with more precise illustrations regarding this. I know that reaching the end now is somewhat anti-climatic since that is where this article started. Let's review the important components of the zodiac and the natal chart to summarize the information. The chart looks a little like a clock face with 12 sections. However, the 12 houses with four angles are interpreted counter-clockwise and do not start at the top. While using the clock face for the example, 9:00 is the Ascendant, 6:00 is the IC, 3:00 is the Descendant and 12:00 is the MC or Mid heaven. The Ascendant is the beginning of the chart and the first angle. It represents the eastern horizon for your birth location. It is based on the time of day and on the date you were born. If you were born about 6:00 in the morning (standard time) your Sun sign is likely to be near the Ascendant. The Ascendant is similar to Aries on the zodiac. This defines the chart's rising sign. The Immum Coeli or the Nadir is the second angle. It represents the northern horizon for your birth location. If you were born near midnight (standard time), your Sun sign is likely to be near the IC. This is the beginning of the fourth house. The IC is similar to Cancer on the zodiac. The Descendant is the point opposing the Ascendant and is the third angle. It represents the western horizon of the chart. If you were born about 6:00 in the early evening, then your Sun sign is likely to be near the Descendant. This is the beginning of the seventh house. The Descendant is similar to Libra on the zodiac. This defines the chart's setting sign. The Medium Coeli or the Mid heaven is the fourth angle. It opposes the IC representing the southern horizon. If you were born near noon (standard time), your Sun sign is likely to be near the MC. This is the beginning of the tenth house. The MC is similar to Capricorn on the zodiac. Your natal chart represents you, being the center of the four directional angles (east, north, west and south) of the horizon on the date, time and location of your birth. The unobvious information in this piece is that, even though we read the chart counter-clockwise, the Sun was moving "clockwise" throughout the day in forming the chart. Being born close to midnight(ish) is for the IC of the chart, 6 a.m.(ish) is for the Ascendant, noon(ish) is for the MC and 6 p.m.(ish) is for the Descendant. As such, the "rising" of a planet is in a clockwise direction within the chart which is the opposite direction of the house numbering. To create an astrology chart, it must be "cast" (calculated and drawn) before it can be "delineated" (interpreted). Last, but not least, the Western/Tropical chart calculations are different from the Jyotish/Vedic/Hindu systems. However they look similar enough to be confused with each other. If you are new to learning astrology, it is highly recommended that you stick to one system first before exploring others or assuming that they are all the same. You can make your own chart with our online Chart Maker! * Remember, despite the language used, the Sun is not moving, the Earth is.